This page contains some of the intros/cracktros I've done over the years. Ultimately I wish to have done more and had lots of cool ideas for new effects, but always to lazy to implement them. 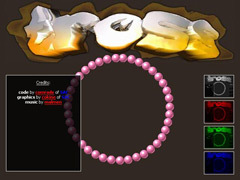 Intro for Tross/CRO (http://www.scener.tk/). Coded in August of 2002. Contains some mediocre effects: a sine-waved image, 3D bobs with morphing. The intro runs a bit fast because I coded this on an old Pentium 133 machine and my timing loop is screwed up. The colour scheme is also a bit too bright with a very old CRT monitor I couldn't see well on. Executable + source code: tross.zip. Listed on Roy/SAC's webpage here (#3 on the page). A cracktro for MYTH. Coded in August of 2002. 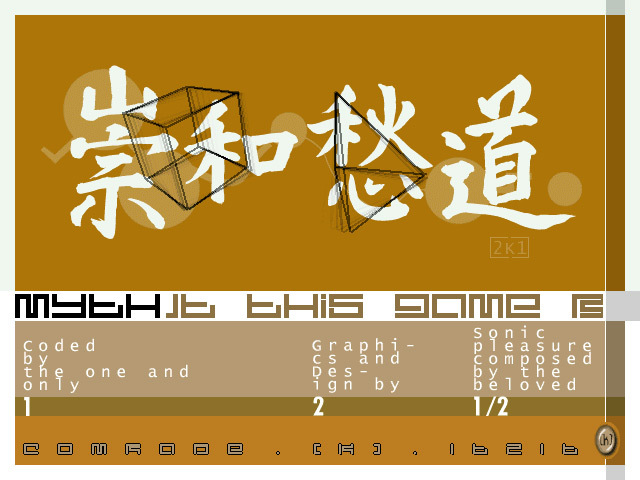 Contains a simple scroller, and rotating 3D cube and pyramid with a motion blur effect. Executable + scroller editor: mytintro.zip. Listed on Roy/SAC's webpage here (#2 on the page). A 256-byte intro for #asm compo #7. Coded in May of 2003. Contains a simple roto-zoomer of the string 'comrade' that rotates through a bunch of colours. Executable + source code: roto256.zip. A 4kb intro for #asm compo #6. Coded in February of 2002. 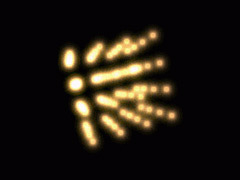 Contains a 3D cube made up of burning flares that morphs into a circle and back. This was my best entry for the #asm compo - I came in 2nd to matja, whose entry was in C! Executable + source code: flares.zip. A 1kb intro for #asm compo #5. 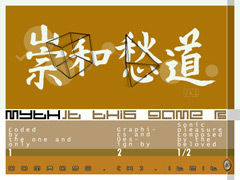 Coded in December of 2001. 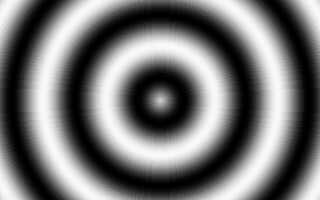 Contains a psychedelic looking sine-wave coloured circle. The intro is really 343-bytes only, the rest bytes are filled with junk. Executable + source code: 1kb.zip. A 95-byte animation of snow falling down. Coded in July of 2001. Executable + source code: tinysnow.zip.